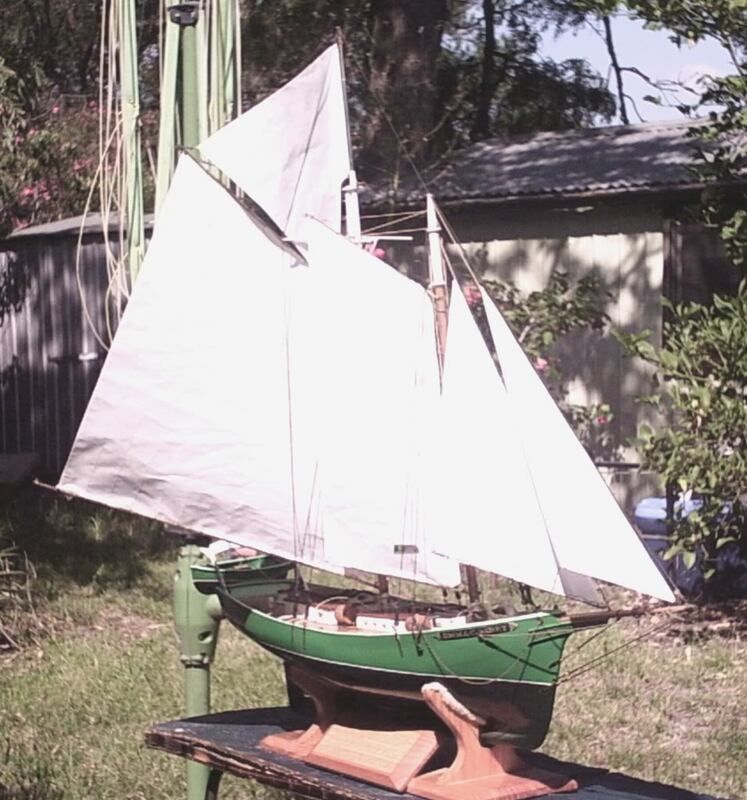 Built from a Stirling Models Kit (USA) around 1971/2 to help my dad work through a physical breakdown I lay-by'd it at the hobby shop I worked at at the time with Radio and everything needed to finish her $600 was a lot of money back then years later when I got married he gave her to me. 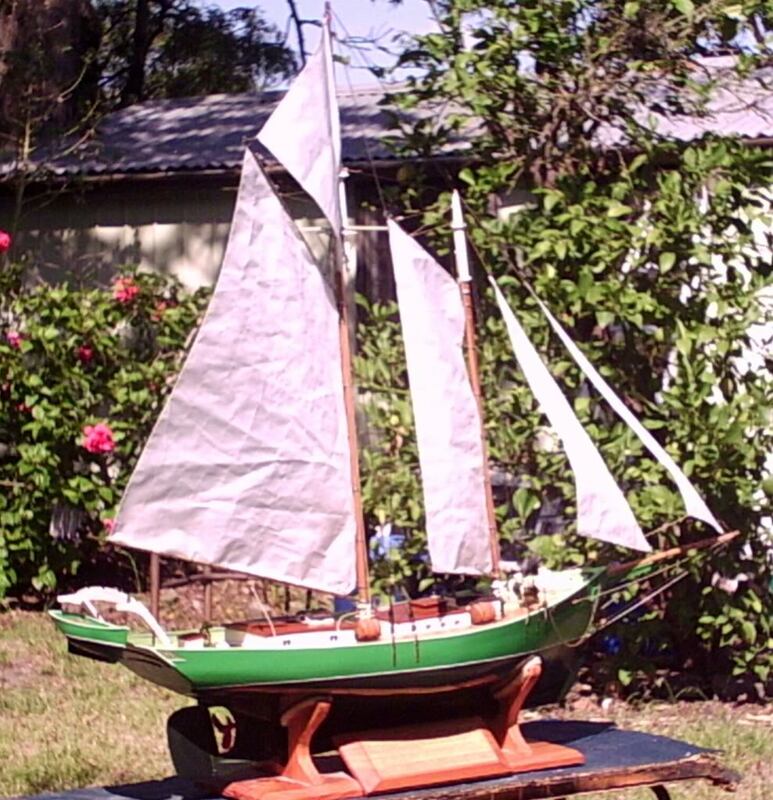 I did sink her once when a squall hit her broad side ooh the water was cold mid July (winter)Emma 100ft from bank 4ft deep top 2" of mast visible in wave troughs not leaving her behind was sick as for months after. Phil retrieval was a must dry she weighs 8kg I'd hate to think what she weighed completely full of water I was a newby to sailing back then I didn't know to pin hatches or that scale cotton sails when wet have high surface tension when she was blown on her side the sails got wet and the hatch covers floated away the 2 x 6" sq hatches allowed quick water ingress and down she went & into the water I went. Upon arriving home I changed clothes and to my wife's horror I commenced stripping the radio gear and home made winches and drying everything with a hair dryer I was successful she is still fitted with the original 6ch Futaba FPT-6 gear. eventful life. Reckon it's time to get her bum wet again. Thanks Geoff I'm thinking on it i'll need to make a new battery pack for the winches and motor she originally had 8 x D cell 4Ah pack that have long since died as Nicads do. I have enough 2800mA AA cells to do 2 sets of 8 in parallel I might even replace the original Futaba speed controller big bulky beast it is. Hadn't thought that far Phil, or remembered the System is 5 wire 29Mhz with S3 servos with switches on top for winch control with limit switches each end of the winches. Well I made a decision to replace all the brass tube booms and the s/hand antenna top mast that was put in to fit a car boot for taking to water 15+ yrs ago and replace with turned dowel, and test all the 38yo Futaba RC gear and oil the Archimedes screw winches I made and put together a travel box to fit my trailer to make her ship shape I'll also remove the prop so it doesn't foul with weed really looking to wetting her bum again. I also have to work out how to launch this monstrous Lady. Perhaps an extendable handle that attaches to my trailer would suffice. Ok opened her up to show 40+yo winches before commercial winches came available. They are based on the Archimedes screw 3/4 copper pipe with a 3/16" slot cut length wise with bearings each end and a traveler on 1/4" threaded rod to do the work. I built 2 one each for mainsail and the 2 jibs they're 13 1/2" overall length. As you see from the pic's the wiring is complex I hope it still works as I lost the memory section of the brain in radiation for a grapefruit size brain tumor that had all my electronics skills, I didn't lose model building though just what I'd made a living off for many years all gone lol They call it acquired brain injury and is very common with radiation to the brain. I had to call my son for help with the battery box. I cant believe I posted on pd site, (very rare I go on it.) I thought I was on here, hope you can save this method of yours and show it running, I think it is was a great invention of yours keep up the good work on it. If it all still works I'll keep it for sure no hope of working out the wiring now without a schematic diagram of it all. each winch has 2 limit switches, a servo with 2 micro switches for winch forward and reverse as the pic's show wires everywhere. Officially the schooner belongs to my son as after my brain surgery in '94 I was not expected to live 2 of my brothers fought over who would get the model that their dad built they were 5 and 6yo at the time it was built and had no idea of the circumstances regarding it's builds I signed it over to my son to go to first son of each generation. I've taken a new lot of pic's of photos from album.